The large, modern town of Milton Keynes in Buckinghamshire is a popular playground for businesspeople and individuals looking for entertainment outside of London (which lies just 45 miles away). It’s conveniently situated off Junction 14 of the M1 motorway and is easily reachable via the West Coast Main Line train service. 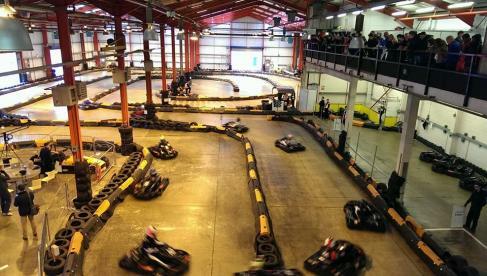 Therefore, if you’re seeking a location in Buckinghamshire that offers excellent transport links and a steady supply of exhilarating entertainment, Milton Keynes go karting tracks are a must-see. Whether you prefer to get behind the wheel on an indoor or outdoor track is up to you. However, at outdoor go karting tracks like Daytona Milton Keynes, you’ll find that the fun doesn’t stop just because the sun’s gone down. Thanks to the floodlit International, National, and North circuits, you’ll be able to indulge your need for speed between the hours of 9am and 10pm. The North Circuit is perfect for beginners, providing a safe learning environment for junior karting, cadet karting, kids birthday parties, or your first Arrive and Drive experience. Daytona is also an excellent choice for corporate karting events, team building days, and stag party and hen party groups, because in addition to some terrific track-time, you can take advantage of Platoon Laser – a fun-filled laser tag combat zone. Formula Fast Indoor Karting is another of Milton Keynes’ most exciting go kart venues, and if you’re a company looking to arrange team building activities or corporate karting events, you’ll find that the venue offers some excellent conferencing facilities where you can hold a meeting before or after hitting the track. Formula Fast is also a pro at hosting Arrive and Drive, cadet karting, junior karting, and kids birthday parties, and if you’re organising a stag party or hen party, they can even fit the stag or hen’s kart out with an L-plate!